Primaforce Yohimbine HCL is a dietary supplement that delivers 2.5 milligrams of yohimbine per serving. In clinical trials, yohimbine has been shown to treat erectile dysfunction and has been used to treat lack of arousal in women and the sexual side effects of SSRI antidepressants. Primaforce Yohimbine is most commonly taken by bodybuilders and athletes to promote fat loss and increase the metabolism. Users of this supplement say that it boosts energy levels and helps during a cutting cycle. Yohimibine is an alkaloid derived from the bark of Pausinystalia yohimbe, an evergreen tree that grows in several tropical west African countries, including Gabon, Congo, Cameroon and Nigeria. Traditionally, yohimbe bark has been used in west Africa as a general tonic, a performance enhancer for athletes and an aphrodisiac. The alkaloid yohimbine has been used in veterinary medicine to reverse sedation in deer and dogs. While yohimbine HCL was previously prescribed for erectile dysfunction, it has been replaced with more effective modern medications. Most of the research on this supplement has focused on its benefits for sexual performance. However, the majority of user reviews of Primaforce Yohimbine HCL demonstrate that this supplement is more commonly taken to promote weight loss. Primaforce Yohimbine HCL is one of several yohimbine supplements available over the counter in the United States. It is available for $10 per bottle and each bottle contains 90 capsules. Researchers from the Institute of Sports Medicine performed a clinical study to determine the effects of yohimbine on exercise performance and body composition of professional soccer players. Twenty top-level male players took part in two randomly assigned trials; one group took 20 mg of yohimbine per day in two equal doses, the other received a placebo. The yohimbine group experienced a significant decrease in body fat. However, there was no difference in exercise performance between the yohimbine and placebo groups. Neither group reported side effects. 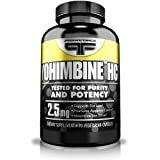 Pimaforce Yohimbine HCL has 441 reviews on Amazon, 52% of which are five-star reviews. Negative reviews cited side effects such as dizziness, lethargy, anxiety and increased blood pressure. Several negative reviews also mentioned that, for the reviewer, the product was ineffective. Positive reviewers, when mentioning the negative reviews, say that the user may not have taken an adequate amount to see results. The recommended dosage of Primaforce Yohimbine HCL depends on the desired effect. Each capsule contains 2.5 milligrams yohimbine. For athletic performance, 20 mg yohimbine HCL was taken twice daily for 21 days. For erectile disfunction, participants took a range of 1 to 100 mg yohimbine HCL daily divided into doses two to four hours before sexual activity. For fat-burning, the recommended dose is .2 mg for every kilogram of body weight. An effective dose for a 200 pound man would be 18 mg.
Data for other uses is currently incomplete. Yohimbine is not recommended for use by children, people with heart disease or people who suffer from anxiety. Primaforce Yohimbine HCL can cause adverse effects if it is used improperly or taken by individuals with a high sensitivity to stimulants. A number of side effects and adverse effects have been associated with yohimbine when taken at higher than recommended doses. According to Memorial Sloan Kettering Cancer Center, yohimbine can cause high blood pressure, anxiety, nausea, nervousness, dizziness, rapid or irregular heartbeat, sleeplessness, urinary problems, psychiatric symptoms and diarrhea. Two unrelated deaths have been attributed to yohimbine overdoses. A 39-year-old body builder experienced acute neurotoxic effects that included vomiting, malaise, loss of consciousness and repeated seizures. The symptoms abated 12 hours after treatment. A 42-year-old man, after taking yohimbine for impotence, experienced kidney failure, skin eruptions and lupus-like symptoms. Because these symptoms were not present before taking yohimbine, doctors attributed them to the supplement. A 42-year-old man experienced severe pain and a persistent erection requiring surgery. A review of adverse drug events (ADEs) reported to the California Poison Control System (CPCS) explored 238 cases in which side effects of Yohimbine were reported between 2000 and 2006. 98.7% of cases involved users taking yohimbine supplements, as opposed to the prescription drug. The common reasons for use included weight loss, stimulant effects and sexual enhancement. Common adverse events reported included elevated heart rate, gastrointestinal distress, hypertension, anxiety and agitation. Yohimbine exposures were more likely to require treatment at a healthcare facility than the average substance exposure reported to CPCS. Researchers saw a substantial increase in the prevalence of adverse events with yohimbine over the seven-year period studied. Check with your doctor before taking Primaforce Yohimbine HCL supplements. This product may not be appropriate for all people and could interact with other medications you are using. Primaforce Yohimbine HCL is available from a number of online outlets including Primaforce’s own website, Amazon, Vitamin Shoppe, Supplement Warehouse and a number of bodybuilding, fitness and weight lifting sites. It can also be found at a number of brick and mortar retailers like Walmart and Walgreens. The supplement is typically sold in a 90 pill bottle or a three bottle pack. Primaforce Yohimbine HCL can be purchased without a prescription in the United States, but is not available in Canada, UK or Australia. These countries have banned the use of yohimbine supplements due to the risk of side effects.